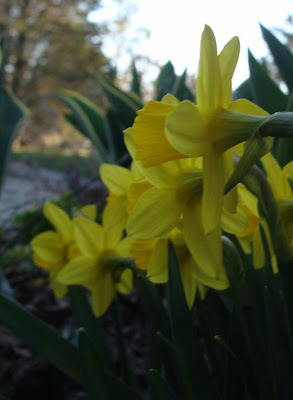 It was one of those strange late-April days when a slow spring suddenly plunges into full summer. 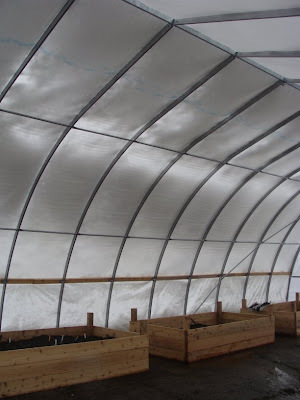 We had to wind up the greenhouse walls a bit, to bring the temperature down, as it was hitting 32°C (90°F) in there at midday. It was only when I got home and started looking them up that I realised that these little flowers are called hepaticas (Hepatica americana). 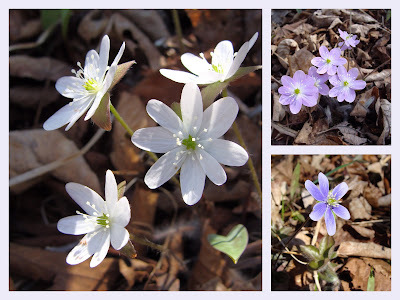 Then I discovered that there are botanists who think that hepaticas should really be reclassified as anemones. So perhaps it doesn't matter too much what they're called. They were very beautiful, either way! 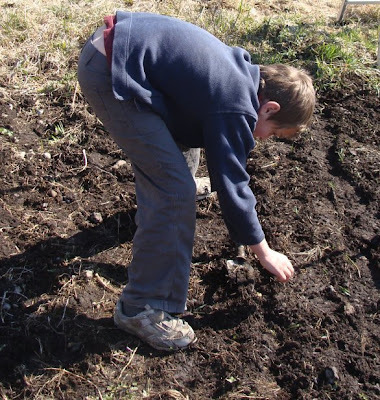 I was diligently turning over the giant compost heap I made last October. 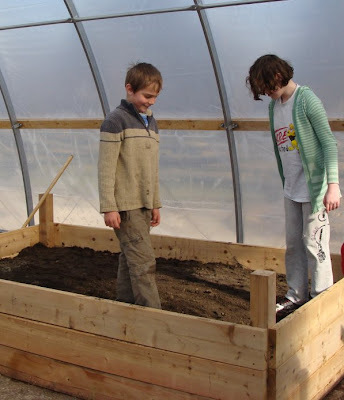 It doesn't look much like compost yet, to be frank, but it began to look a bit more like soil near the bottom. 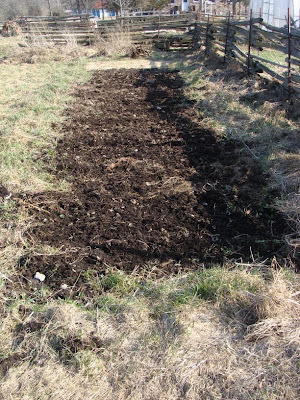 I started putting some of this compost on a nearby bed (earmarked for corn this year). 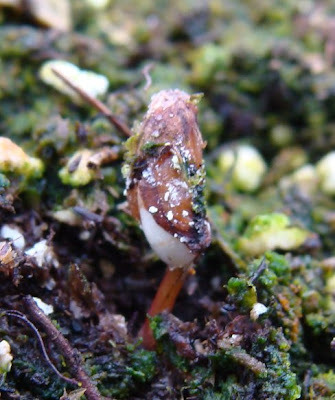 Then, as I pulled a forkful of compost away, the air was suddenly filled with piercing squeals and a small nest fell away from the bottom of the fork, tumbling these little beasts out onto the ground. They were not at all happy about being disturbed, I can tell you. I wasn't very happy myself, come to that. 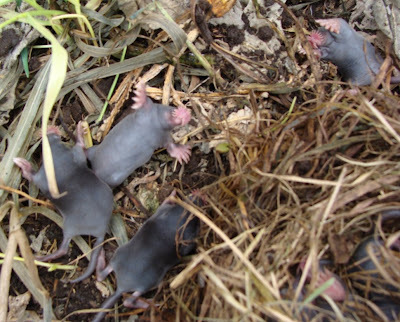 I felt instantly terrible - a mole-molester - but also fascinated at seeing these tiny creatures. I ran off to get a couple of trowels so that I could move the moles without making them smell of human (although my hands were fairly comprehensively covered in compost by this time, so that might not have been a big problem). I also got the camera (because otherwise you wouldn't believe me, right?). I carefully lifted the nest (which still had a few moles inside it - you can see it (and a mole's foot) in the bottom right of the photo above) back into the hole it had come out of, then scooped up the four 'loose' moles and returned them to their siblings. They stopped squealing once they were back in the nest. 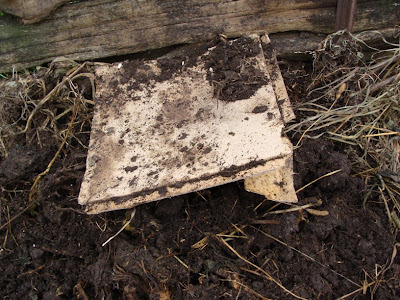 Then I re-packed some soil around the nest and covered it over with a handy piece of wood. I sincerely hope that the mother mole will come and rescue her brood and take them to a safer spot. 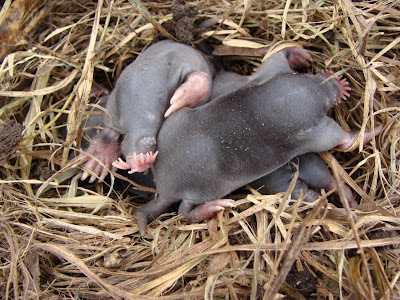 Their eyes aren't open yet, but they're about half the size of an adult so I'm guessing that they're nearly two weeks old (based on the Wikipedia information on Star-nosed moles). I hope they make it to adulthood - sorry for disturbing you, little moles. 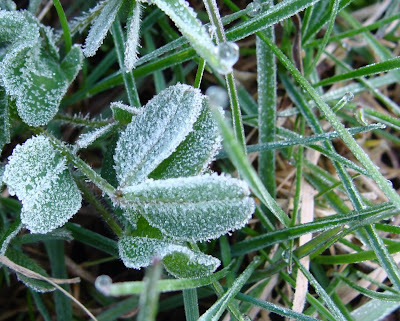 The slightest of ground frosts this morning - I could almost see the frost turning back to dew as I took these early-morning photos. 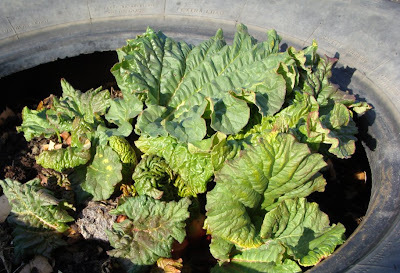 and next door to the asparagus, the rhubarb leaves are unfurling. The gutter-grown peas have done so well that I transplanted them into the garden last night. 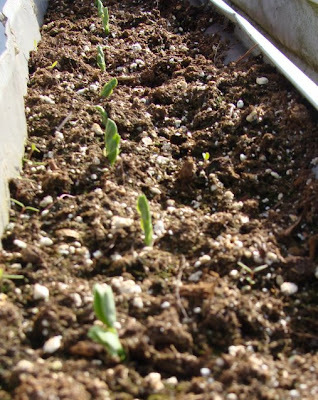 The germination of the Lincoln peas was more patchy than the Oregon Sugar Pod II snow peas/mangetout, so I've sown more peas in amongst the Lincolns. The picture is of the more impressive row of snow peas. 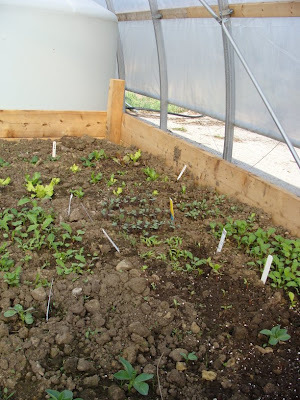 I'm using some of the space in the greenhouse raised beds as nursery beds for the brassicas. 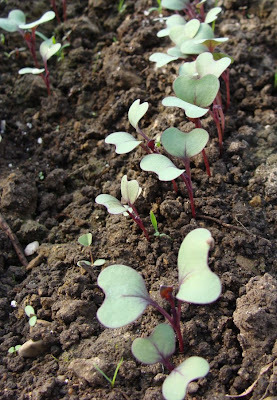 Don't these baby red cabbages look gorgeous? Like tiny green butterflies, I think. And on the subject of birds, I ordered my first set of chicks yesterday. I'm going to start of with a set of a dozen Buff Orpington hens from local specialists Performance Poultry. We'll be collecting them in six weeks or so. Really looking forward to this new venture! I'd heard of Key lime pie a long time before I heard about Key limes. For a long time I had dismissed it as something I'd want to make purely (and utterly unfairly) on the basis that it sounded like Mississippi Mud Pie, which I think of as an impossibly sweet dessert. 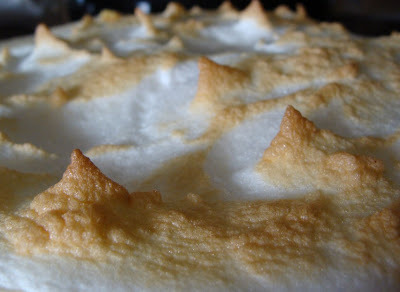 Although it does contain condensed milk and is topped with meringue, Key lime pie is closer in taste to a lemon meringue pie and the tartness of the limes makes it more 'grown-up' than the Mississippi offering. It is also similar to the Hamlyn All Colour Cookbook's chilled lemon flan that my mother used to make (but which didn't have the meringue topping). Key limes are much smaller than regular limes. 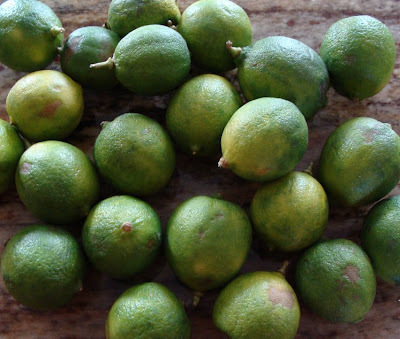 My recipe declared that they are sweeter than ordinary limes, while Wikipedia says that they are more tart. So I'm not sure which is right. They're quite fiddly to juice as they are so small - my usual juicing device was too broad to fit inside the tiny fruit, so we had to use a wooden juice reamer instead. My mother-in-law was helping me and mentioned that her cookery teacher told the class that they should be able to hold the bowl of meringue mixture upside-down over their heads when it got to the required stiffness. That seemed a bit cruel to me - I wonder how many girls ended up with a meringue shampoo after trying this trick! This is the long bed that was covered in snow last week (looking from south to north this time, in case you're getting a bit bored of the same view). 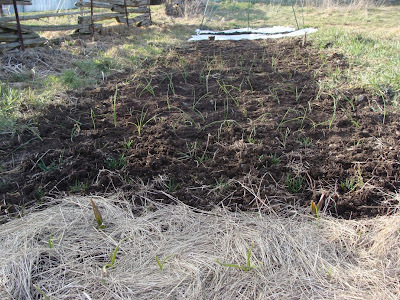 The over-wintered garlic is closest to the camera, still under its mulch of hay, followed by the Egyptian walking onions and then about ten rows of the onions I sowed indoors in January. These were transplanted on Sunday. 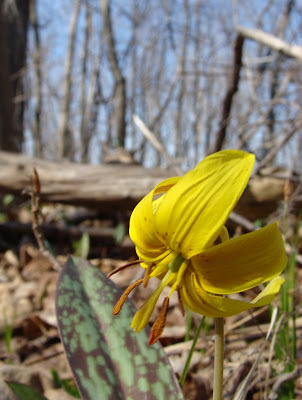 I think there are about 100 of them - Early Yellow Globe and Sweet Utah (a Spanish onion). In the distance you can see some slightly wobbly pea supports and two white stripes which are the strips of horticultural fleece I've put down to protect the carrot seeds. It has taken me until this year to realise that these strips are the 'floating row covers' I've seen mentioned on North American blogs. I don't know why, but somehow I imagined that those were something rather more sophisticated, like a cloche, perhaps. 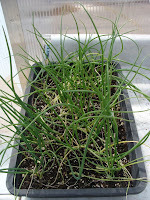 There are parsnip seeds immediately behind the onions, meaning that there is now only a small gap in this bed without seeds or transplants in it (an area of about 16 square feet). I'll be filling that with the peas from the greenhouse and successional sowings of carrot and beetroot seeds. 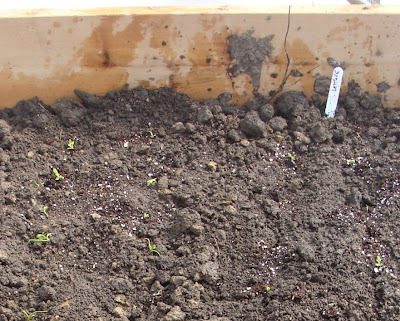 I didn't have this bed last April and was getting very frustrated at being unable to sow any seeds in the much damper, colder, lower vegetable garden (which is only a few feet away from this bed). It's amazing the difference a gentle slope makes at this time of year. 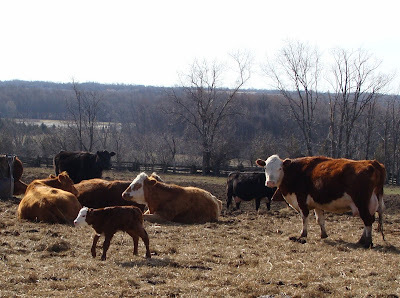 I couldn't resist stopping to take this picture of a young calf and its mother on my way to Deseronto today. It really feels like Spring now. Well, maybe in 2020 it will be. A conversation about artificial versus real Christmas trees last December over on Poor Richard's Almanac prompted me into action. 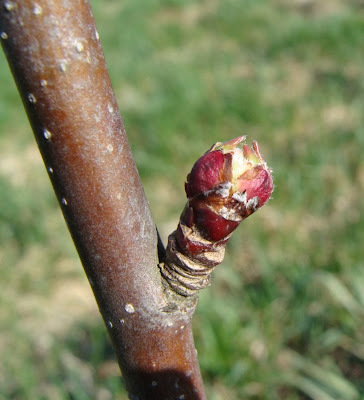 I've got the space to grow my own trees, after all and I hope I'll have the time! So I ordered a batch of Balsam Fir seeds from a website called TreeHelp (which is based in the US but also has a Toronto shipping centre for Canadian customers). 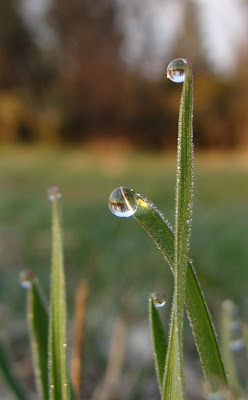 The seeds needed to be soaked in water for 24 hours and then cold-stratified (i.e. 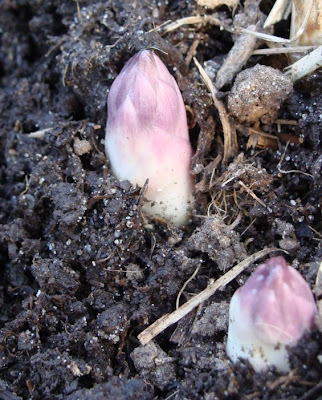 kept in damp compost in the fridge) for 30 days. I put them out in the greenhouse after that to take their chances. I figured that the fluctuations of temperature in there wouldn't be too dissimilar to what the seeds would experience naturally on the floor of a forest in the Spring. For many weeks we've been peering into the tray of increasingly-green-looking compost and wondering whether anything was actually going to happen in there. 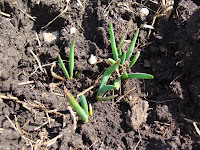 Today our patience was rewarded when I found not one, but TWO little shoots. At least, I'm hoping that they're balsam fir seedlings, rather than random weeds that have found their way into the container. At $6 for 40 seeds, even if only one of these makes it to adulthood, it will still be quite a lot cheaper than buying a tree from elsewhere. 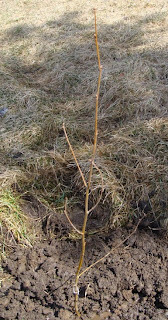 This is the first time I've ever grown a tree from seed - it's exciting! At one point he said "I didn't know gardening could be this much fun!". It would have been hard for him to find better words with which to swell my heart with motherly love. 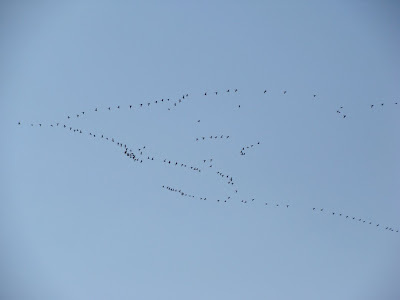 As we worked, we were treated to periodic fly-pasts of huge groups (skeins, I suppose I should say) of Canada geese. The photo doesn't do justice to the experience, as the noise these birds make as they go over is amazing. You can hear them coming a long time before they are visible in the sky. If you turn the sound up loud and play the video below, you will get some of the effect. With a little of one of our neighbours' chainsaws, too, for that authentic Canadian flavour. Mike was bringing down some of the big logs he'd cut from fallen ash trees in the last few weeks. His mum decided that the log splitter looked like fun, so got going on getting the biggest ones split up. After doing about 20 she was very tired, but felt that she'd earned her lunch (obviously I wouldn't have let her have any if she'd only managed 19!). I had a bit of a crisis in the tomato-seed-starting department, when I realised that the lovely new seed trays/flats that I'd bought here in Canada would not fit inside my purchased-in-England electric propagator. Which I had to buy a voltage transformer to get to work here. Is everything is bigger here (except for voltage), or is it that everything is smaller in England? I noticed that kitchen rolls in England looked tiny on my recent trip back. Now that I'm aware of this seed-tray disparity, I'm using my smaller, English, trays for the seeds that need that extra bit of help from the propagator to get started. However, my large tray of mixed tomato seeds (seven different varieties!) had already been sown before I realised my problem. Now you may have noticed from my earlier post today that we're back in winter at the moment. Consequently, we had lit the woodburning stove in the kitchen. Which has a large flat area on the top of it. 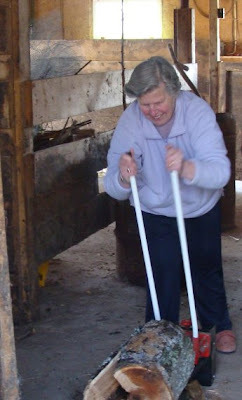 I had a conversation with my aunt this afternoon in which the need for 'bottom-heat' for tomato seeds was mentioned. Later on it occurred to me that today I might be able to provide those seeds with the warmth that they really need. 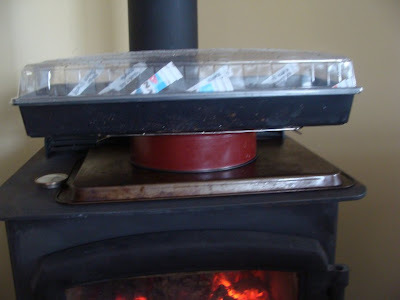 Now obviously, putting the plastic seed tray directly on to a stove that is capable of boiling a kettle would be foolish, so I experimented with kitchen equipment until I came up with an arrangement which seemed to provide a reasonable level of warmth without creating a melting mess. At this point, the fire in the stove is not being added to, so the whole affair will be gradually cooling over the next few hours. I will report back on whether this unorthodox arrangement has the desired effect. 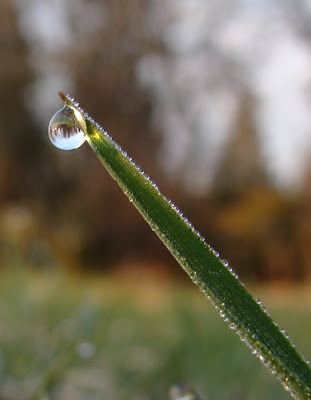 In the first week of April we've had 82mm (over three inches) of rain. Which is more than we had in the whole month of April last year. 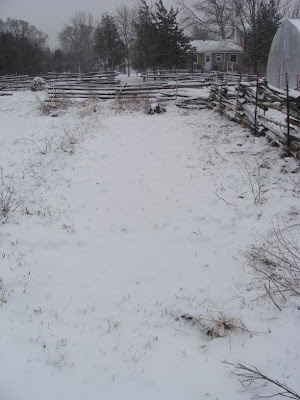 On Sunday the weather gave us a reminder that it is Spring and I was able to get out into the vegetable garden and fork over the two long beds in the 'upper' vegetable garden. They were remarkably dry and workable, despite the absolute soaking they'd had in the previous two days (though the beds next to the greenhouse were still looking more like ponds). The temperature in the greenhouse managed to stay above freezing, although it's a bit dark in there with all the snow on the roof. The sun is beginning to show itself now, so I don't think this snow will stay around for long.